A mere five years elapsed from the time Echo, a gas-filled metallized plastic sphere that passively reflected radio signals back to Earth, was launched and the time that 35 television cameras had been launched into space. The Space Race was at a fever pitch. Although the Ruskies beat us in being the first to launch both an active satellite (Sputnik) and a man (Yuri Gagarin) into space, America's deep pool of intellectual resources, consisting of both native scientists and many of the world's top scientists who chose to flourish in freedom here rather than oppression behind the Iron Curtain, fostered the advantage that in short order established the United States as the leading super power both in space and on terra firma. TIROS satellites began providing real-time visual data on the Earth's weather in 1960. 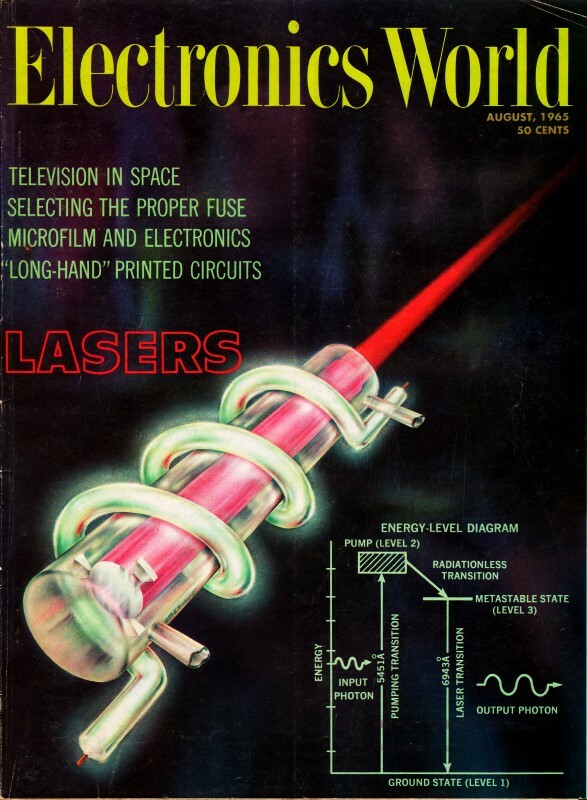 Not only were cameras transmitting images of the Earth, but a month before this issue of Electronics World went to press the Mariner spacecraft sent close-up images of the planet Mercury's surface. A year before this article Syncom 3 became the first communications satellite in geostationary Earth orbit. A year after this article Lunar Orbiter beamed back photos of the moon's surface in preparation for the Apollo missions that would transport the first humans to and from the moon. We are now nearly at the point where amateur rockets are powerful enough for anyone with enough technical savvy to launch a small payload into low Earth orbit - something the world's militaries are not looking forward to. Of the 35 TV cameras sent into space, some use slow-scan, some use digital techniques, and one uses a unique line-by-line scan from processed photographs. The Mariner Mars, Ranger, lunar Orbiter, and Apollo spacecraft are covered. 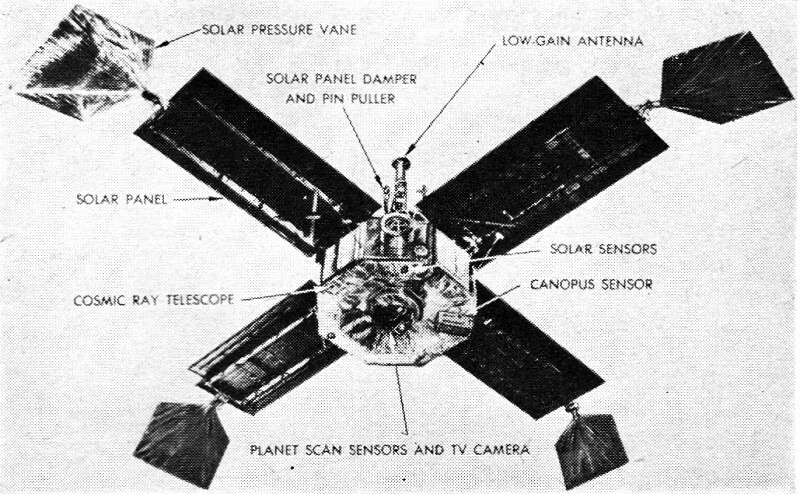 The first use of a TV camera in space took place on April 1, 1960 aboard the Tiros I weather satellite. This spacecraft carried two TV cameras into a 400 mile high orbit to photograph weather conditions around the world. Since then, thirty-three more TV cameras have been successfully launched into space on eight more Tiros vehicles, Nimbus I, the Ranger lunar spacecraft, and the Mariner Mars, now approaching the red planet. Three Ranger spacecraft, each using six television cameras operating in the slow-scan mode, have successfully taken the first close-up pictures of the lunar surface. These shots will be followed by Lunar Orbiter, Surveyor, and then manned landing by two astronauts from the Project Apollo spacecraft. 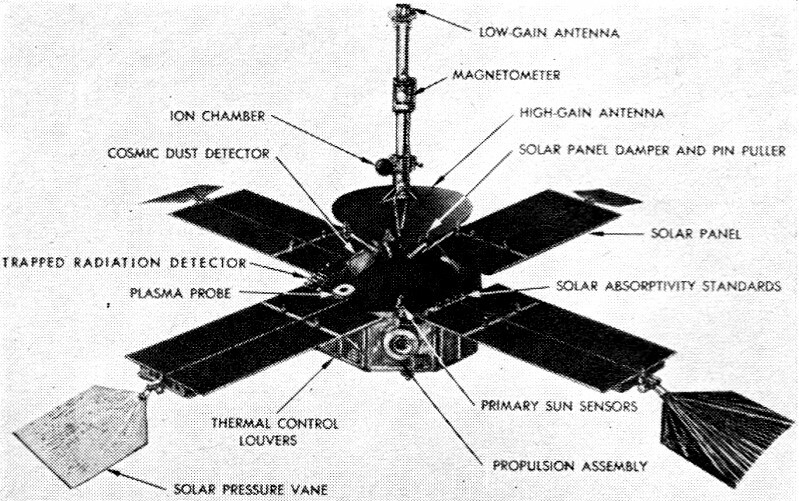 At 5:10 p.m. PST on July 14, 1965, after a flight of some 350 million miles taking about 7 1/2 months, the 575-pound Mariner Mars spacecraft (Fig. 1) will take about 20 photographs of the red planet and, after passing by at slightly above 11,000 mph relative to Mars, will radio those photos back to earth. Fig. 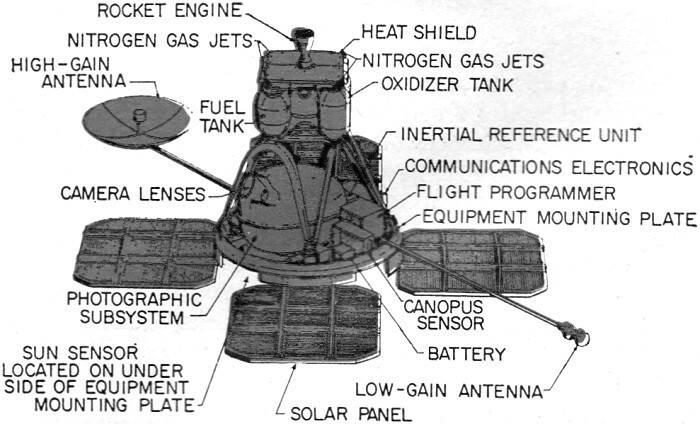 1a - Top view of the Mariner Mars spacecraft now headed past Mars and expected to take and transmit photographs. Fig. 1b - Bottom view of the Mariner Mars spacecraft now headed past Mars and expected to take and transmit photographs. The spacecraft is designed to make eight scientific investigations. Six of these are intended to measure radiation, magnetic fields, and micrometeorites in interplanetary space and near Mars. The seventh is an occultation experiment designed to determine the characteristics of the Martian atmosphere. The eighth experiment, the taking and transmission of photographs of the Martian surface, will be covered here. The resolution of the TV pictures of Mars and the area of the planet they will cover are difficult to predict because these factors will depend on the fly-by distance from the planet. However, if planned trajectories are achieved, these pictures should be comparable in detail to photographs of the moon taken by the best earth-based cameras. If the desired accuracies are obtained, the spacecraft will pass within 5600 miles of the Martian surface; if it is on the desired trajectory, the spacecraft will pass Mars between the Martian equator and the South Pole on the trailing edge of the planet as viewed from earth. It will then pass behind Mars for approximately one hour and subsequently re-appear to earth trackers for completion of the program. A high-gain antenna is attached to the spacecraft atop the main octagonal body. Its 4 1/2-pound honeycomb dish reflector is an ellipse, 46 by 21 inches, parabolic in cross-section. This antenna is pointed towards the earth during planet encounter and post-encounter phases, and it is painted green to keep it at operating temperature during planet encounter but within its upper thermal limit earlier in the mission. A low-gain omnidirectional antenna is mounted at the end of a circular aluminum tube 3.88 inches in diameter and extending 88 inches from the top of the octagonal structure. The tube acts as a waveguide for the low-gain antenna. Primary power is from 28,224 solar cells mounted on four panels facing the sun. A rechargeable silver-zinc battery provides spacecraft power during launch, mid-course maneuver, and whenever the solar paddles are turned away from the sun. Nominal power from the panels is 640 watts near the earth, decreasing to about 310 watts during Mars post-encounter. Total power demands during the mission range from about 140 watts during post-encounter playback of the TV data to 255 watts for a mid-course maneuver. Primary power to the spacecraft TV system is 2400 cps, 50 v.r.m.s. The 100-channel telemetry subsystem is capable of sampling the 90 engineering and science measurements being made. All engineering and science data except the TV pictures will be transmitted in real time. The science data at Mars encounter will also be recorded, along with the tape-recorded pictures, for retransmission with the photos. The television system is divided into two portions: the slow-scan camera head and a small segment of the electronics mounted on a scan platform; and the remainder of the electronic equipment, including the tape recorder is placed in a compartment within the spacecraft frame. The basic TV system is shown in Fig. 2. Fig. 2. Basic TV system as used in the Mariner Mars spacecraft. The analog video information is converted into digital form. The heart of the camera is an electrostatic vidicon with a specially developed target surface having 200 scanned lines with 200 picture elements per line and capable of storing the image for 24 seconds. A picture is formed on the vidicon target in 1/5 of a second every 48 seconds. The scanning, or readout, of the 200-line picture requires 24 seconds while image erasure and preparation for the next picture takes 24 seconds. Working in conjunction with this vidicon is a solenoid-operated shutter disc containing four openings for alternating optical filters. Two filters will be orange-red with the other two blue-green. These filters will provide high contrast in the black-and-white photographs received on earth and will emphasize the difference in Martian coloration as seen from earth. The optical system for the camera consists of an ƒ:8 Cassegranian telescope system of 12-inch equivalent focal length. Its beryllium primary mirror has a diameter of 1.62 inches and an ƒ ratio of 2.47, while a beryllium secondary mirror provides an amplification of 3.0. The over-all camera system will be capable of resolving objects about three miles across at the fly-by altitude. Approximately six hours before the fly-by, internal commands (or earth-based signals) will turn the camera system on. However, pictures will not be recorded until a narrow-angle planet-acquisition gate having a 1.5° field of view generates a signal indicating that Mars is within camera range. As a backstop, when the vidicon senses the increase in light due to solar reflection from the Martian surface, this gate also signals for tape-recorder start. It is anticipated that the camera system will sweep through a large illumination range on Mars that will include the shadow line or terminator; therefore, the system is equipped to decrease or increase its internal amplification with either an increase or decrease in the amount of available light. Some 20 resultant photographs will be taken during the fly-by. The signals for these images will be recorded and stored in digital form on magnetic tape until the earth station requests transmission after the spacecraft has appeared from behind Mars and is in view of the earth antennas. These photographs will be taken in groups of two with a small time gap between each pair. Depending on camera distance from the surface, each pair will cover overlapping areas of the Martian surface. The number of pictures recorded will be determined by the time required at encounter to synchronize the tape recorder and camera for the first picture and by the lighting conditions on the Martian surface. The tape recorder will be turned off after recording each picture and turned on again to record the next. The magnetic tape is a continuous loop 330 ft. long and the data will be recorded on two tracks. Besides the sweep voltages, the electronics associated with the vidicon also includes a 1l0-kc. oscillator that modulates the vidicon beam, thus giving rise to an r.f. carrier signal output modulated by the target information between d.c. and 7 kc. This AM signal is processed to produce a six-bit digital word for each picture element some 200 times per scanned horizontal line, and it takes 24 seconds to read out each frame. The resulting 10,000-bits-per-second information is recorded on the magnetic tape. Upon completion of a vidicon readout, a 12-second erase and prime mode is started, and the target is fully cleansed of the stored image and prepared for the next shot. Once the spacecraft has passed by Mars (about 13 to 15 hours after the last picture is taken) and the spacecraft is in the clear for the earth stations, a tape-recorder transmit signal is sent. Because of the lengthy transmission path involved and the relatively low transmitter power available on the spacecraft, the electronic system reduces the 10,000-bits-per-second recorded video data to a slow 8.33-bits-per-second rate. With this slow transmission rate, it will take about 8 1/3 hours to play back the quarter of a million bits comprising each picture. About 1 1/2 hours of engineering data will be transmitted between each picture. All data from the other scientific instruments will be recorded with the pictures as a back-up for the real-time transmission of science data. Pictures are not erased after transmission. If the communication distance has not been exceeded after one playback of all pictures, each frame will be transmitted again to provide a comparison for the detection of errors that may crop up during transmission. There has been a great deal of speculation about the texture of the surface of the moon but little scientific proof because astronomical observations are limited to details about one mile in size. With such restricted knowledge about the moon's surface, it is virtually impossible to design a manned spaceship to land on the moon. It is for this reason that the Ranger-type vehicle (lead photo) came into existence. The picture-taking sequence begins at a minimum of 13 minutes and 40 seconds before impact at an altitude of about 1200 miles and continues uninterrupted until the vehicle crashes into the moon at a speed of approximately 6000 mph. The initial pictures from this altitude cover a wide area of the lunar surface at resolution comparable to that obtained by earth-based telescopes. As the Ranger falls toward the surface of the moon, area coverage is traded for increasing resolution, until resolutions of 0.5 meter or better per optical line pair are achieved in the final picture sequence just prior to impact. The six TV cameras (Fig. 5) are designated F (for full scan) and P (for partial scan). One of the two F cameras has a 25-mm. (wide-angle) ƒ:1 lens with a field of view of 25°, while the other has a 75-mm. (narrow-angle) ƒ:2 lens with a field of 8.4°. Shutter speed of the F cameras is 1/200 second. Fig. 5. 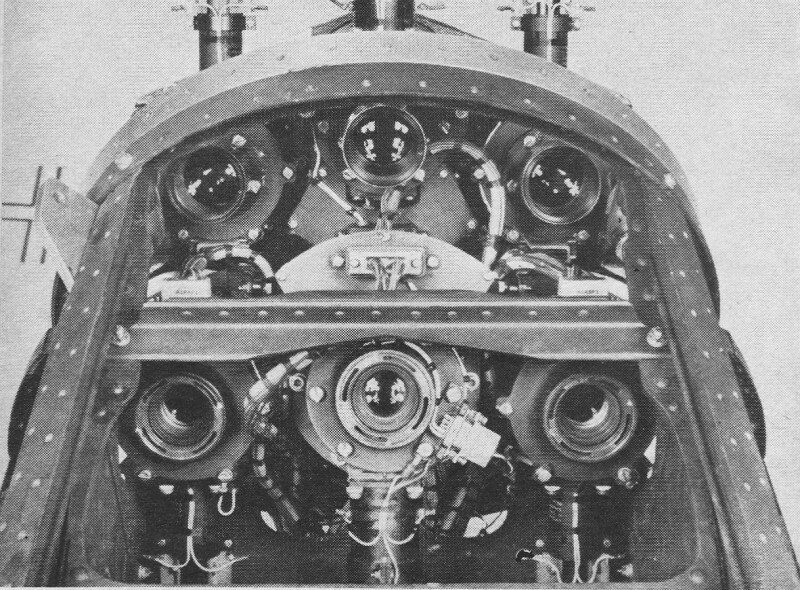 The RCA six-camera configuration used in the Ranger craft. Cameras P1 and P2 have 75-mm., ƒ:2 lenses with a 2.1° field of view, while P3 and P4 have 25-mm., ƒ:1 lenses with a 6.3° field of view. Shutter speed for these cameras is 1/500 second. Video bandwidth is 200 kc. for each channel. The basic timing signals for the cameras are provided by a camera-control assembly, Camera P1 is also provided with a "free-running" capability by the incorporation of secondary synchronization and sequencing circuits within the P1 camera electronics. These circuits enable independent operation of the P1 camera in the event that the P-channel sequencer fails. In the P cameras, the central 282 resolution lines of the 1125-resolution-line camera raster are scanned for readout in 0.2 second. An additional 0.6 second is required for preparation of the camera for its next exposure. Thus, the exposure of the cameras in the P channel is sequenced at 0.8-second intervals to provide for the continuous transmission of video data. The 0.2-second readout time of the P cameras enables the TV system to achieve extremely high resolution in the final sequence of four pictures taken from an altitude of less than 7000 feet above the moon's surface. These final pictures are exposed and transmitted to the earth in the last 0.8 second of flight prior to impact. The cameras used in the F channel are essentially the same those used in the P channel except that in the former cameras the entire 1125-resolution-line raster is scanned for readout in 2.5 seconds. As a result, the area covered by a picture from an 800-line camera is approximately 16 times that of a 200-line camera from an equivalent altitude. In this manner, the two F cameras provide the desired wide-area coverage. Both types of cameras are used to provide area-coverage and high-resolution data during the final few minutes before impact. Both channels (F and P) are capable of independent or simultaneous operation. The power distribution network and signal paths for the two channels are completely independent, with the exception of the r.f. combining network. Metallic focal-plane shutters are used on all camera lenses. This shutter is not cocked as in conventional cameras but is a solenoid-operated, sliding-aperture type that moves from one side of the lens to the other each time a picture is taken. One reason for having several cameras with different lens apertures is that the lighting conditions on the moon cannot be precisely determined from the earth. The different lenses provide greater exposure latitude. The range of lunar lighting conditions covered by the lenses and the dynamic range of the vidicons is about 30 to 2600 footlamberts, corresponding roughly to about high noon till dusk of an average earth day. The camera control sends three types of instructions to the cameras: (1) snap shutter, (2) read vidicon faceplate, and (3) erase faceplate and prepare for the next picture. The vidicon faceplates are erased by special lights built around the vidicons which are flashed to saturate the faceplate. The plate is then scanned twice by the electron beam to remove all traces of the previous image. The vidicon is then prepared to receive the next image. The camera output signals are processed, amplified, and sent to a video combiner that enables sequential transmis­sion of the cameras in each channel. The video combiner provides gating circuitry that blocks the erase-video signal from the vidicons while they are being prepared for their next picture. The output of the video combiner is converted into an FM signal and sent to the two 60-watt transmitters where telemetry information is added as a subcarrier, and the resultant signal is transmitted to earth over the high-gain, four-foot parabolic antenna on the spacecraft. The Lunar Orbiter (Fig. 3) is one of the three NASA programs for the unmanned exploration of the moon in advance of Project Apollo manned landing mission. The Ranger program has given us our first close views of the lunar surface, and it now remains for the Surveyor and Lunar Orbiter programs working as a team to provide specific types of information about selected areas of the moon's surface in order to make a safe manned lunar landing possible. Fig. 3. Configuration of the proposed Lunar Orbiter vehicle. Surveyor will make a soft landing so that its instruments can measure important surface properties while eye-level TV cameras provide visual information. It will be the job of the Lunar Orbiter to make the initial examination so that Surveyor data can be extrapolated over a full-sized landing site. Since protuberances only half a meter high are significant, and the area to be covered is over 8000 square kilometers per mission, heavy demands are made on the Lunar Orbiter's data-gathering capacity. The Lunar Orbiter differs from other video satellites in that it mounts two photographic cameras and a roll of 260 feet of 70-mm film. Once the vehicle has been placed in the desired lunar orbit, its cameras proceed to take the necessary pictures. Using the Eastman Kodak "Bimat" process, the films are fully developed within the spacecraft, and the negatives are stored pending electronic readout with the system shown in Fig. 4. Fig. 4. Line-by-line photographic readout system proposed. The high-resolution film negatives are placed in front of a special flying-spot CRT whose electron beam traces one scanning line only. At the beam intensities required, the phosphor would burn up if it did not keep moving. In this tube, the phosphor is coated on the outer surface of a continuously rotating metal drum. The scan period is 1250 microseconds and the scan line is about 2 1/2 inches long at the phosphor. The emitted light is focused on the film negative through a scanning lens that reduces the line width to 1/10 of an inch. Mechanical motion of the scanning lens moves the now-tiny bright line across the film. It takes about 17,000 horizontal scans of the original electron beam to cover the 57-mm. width of the film negative. This process requires about 20 seconds. The film negative is then mechanically advanced 1/10 of an inch and the scanning lens then scans the next segment in the reverse direction. It takes 40 minutes to read out the 11.6 inches of film negative corresponding to a single exposure. After the bright spot has passed through the film negative, it is modulated by the exposed density existing at each point. Collecting optics then pass this light to a photomultiplier. The video is then combined with the necessary sync pulses, telemetry signals, and a reference pilot tone; then the composite signal is conditioned for radio transmission to the earth. At the earth station, the r.f. carrier is demodulated and the telemetry signals diverted to equipment and stored on magnetic tape, while the picture information is passed on to the picture-reconstruction system for further processing and magnetic-tape storage. 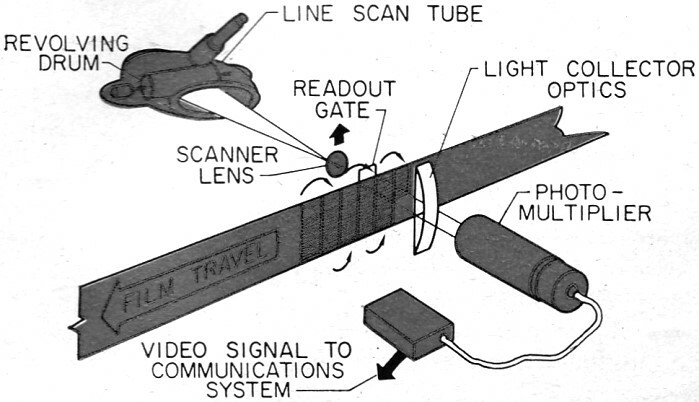 The video data is displayed line by line on a kinescope face with the image being recorded on a continuously moving 35-mm. film strip. The on-board camera has the unique capability of providing dynamic scenes of activities aboard and outside the spacecraft without the necessity of vehicle recovery. Secondary application such as monitoring propellant tanks, launch escape tower, recovery chute development, etc., are probable as the project progresses. These are secondary, however, and the TV camera has been optimized around the public-information requirement. The 4 1/2-pound camera has a bandwidth of 500 kc. with a frame rate of 10 per second with 320 lines per frame. Consuming 6 3/4 watts, the camera has a .1 footcandle highlight-illumination sensitivity minimum and a resolution of 227 lines. It uses a one-inch vidicon and is provided with a 9-mm., ƒ 1:9 lens and a 20- to 80-mm., ƒ 2:5 zoom lens. The camera will be mounted in one of two positions within the spacecraft. One of these positions is near the bottom of the instrument panel and slightly to the right of the center astronaut so as to view the crew during the launch phase. After powered flight, the center astronaut will stow the center seat so as to make an aisle, and he will mount the camera in the second position where it can monitor activities of the crew in this center aisle. The Apollo TV camera feeds into a premodulator where it will be frequency multiplexed with both voice and telemetry data. The composite signal is fed to an S-band transponder, then power amplified and passed through either the S-band omni antenna for near-earth transmissions or the high-gain S-band antenna for transmission from deep space. The camera tube is a 500-scan-line vidicon with a persistence that permits a two-second scan with less than 20% degradation in picture quality. Each wide-angle camera, using 104-degree lenses, nominally takes 16 pictures per orbit at 128-second intervals, providing nearly full dawn-to-dusk coverage. Each picture will cover a 550,000 square mile area. The interval can be reduced to 64 or 32 seconds for overlap pictures if desired. Editor's Note: According to the latest report we have received from NASA on Mariner Mars (Mariner 4), the spacecraft is still holding steady on its course and is continuing to transmit scientific and engineering data from interplanetary space. Although two of the radiation experiments have evidently failed, the other experiments are still operating. It is expected that up to 21 photographs of Mars will be taken when the craft gets as close as 5600 miles of the planet on July 14. 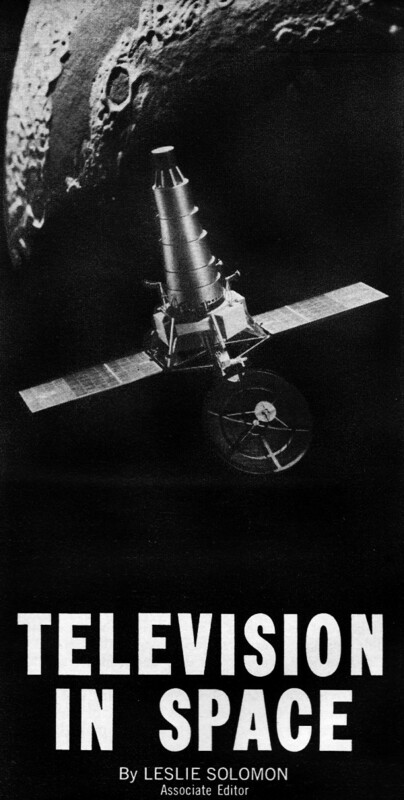 On June 16, Mariner 4 was over 109 million miles from Earth traveling at a velocity of about 57,000 mph.